Kyrie Irving is one of the most exciting young stars the NBA has to offer, but he’s been unfortunately absent while he recovers from a knee injury he suffered in the NBA Finals. Not to worry though, as Irving and his signature Nike Kyrie 1 will be back on-court as soon as next month. And while we’ve already seen brief glimpses of the upcoming Nike Kyrie 2, today we get a look at what could be one of the last options on his first signature with this camouflage colorway. 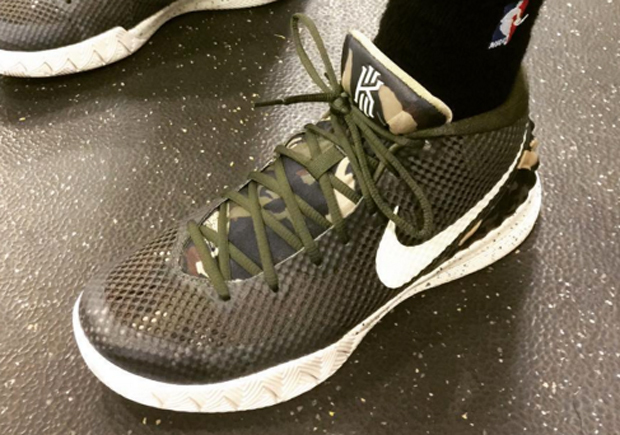 Irving took to Instagram to show off the pair while thanking those who served in the United States military. It’s unknown whether this is an exclusive or if we’ll see this colorway land at retailers or on NIKEiD in the near future. Check out a full look below and let us know if you’re feeling the look by taking your thoughts to the comments section.